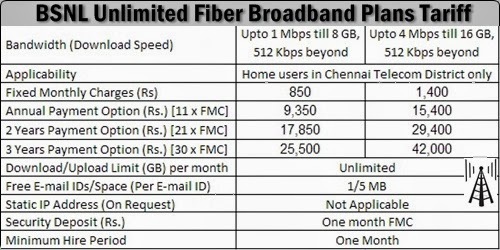 Fast Broadband service provider in India Bharat Sanchar Nigam Limited (BSNL) has introduced Unlimited Broadband Plans under Fiber to the Home (FTTH) across Chennai Telephone District. BSNL Competent Authority has decided to deliver reliable Unlimited Fiber Broadband Plans with fault free services to the customers through fiber cable by installing CPE at home known as Home Optical Network Termination (HONT) to Chennai Telephone District customers. The above scheme will be implemented and with effect from 21-10-2013 applicable for all new/existing customers for Chennai Telephone District Customers.